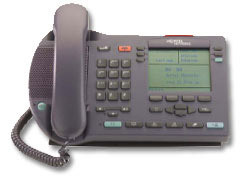 The Nortel IP 2004 Phone (Phase 1) - Nortel Networks internet telephone - is a standards-based, Internet Protocol, desktop telephone that connects directly to the Local Area Network (LAN) via RJ-45 connector. Currently supported on both enterprise and carrier platforms, the display-based IP Phone 2004 is ideally suited for moderate call volume users, such as office professionals and technical specialists. Microsoft TAPI-compliant interface operates with CallPilot and Personal Call Manager providing onscreen displays of call logs, directories etc. Simplified Management: The IP Phone 2004 connects directly into an Ethernet LAN and automatically obtains IP address assignments via a standard DHCP server, reducing the time and costs associated with traditional moves, adds and changes. Advanced telephony feature and application access: Extends traditional telephony features and advanced applications such as CallPilot Unified Messaging and Symposium and Meridian Integrated applications over an Ethernet connection. Common across multiple platforms: Provides investment protection across multiple platforms including Business Communications Manager (BCM), Meridian 1, Succession 1000, Succession 1000M, Multimedia Communications Server 5100 and Service Provider platforms. Power over Ethernet: Power over Ethernet delivers power from the Data Switching Equipment over Ethernet cabling via the IEEE 802.3af specification. By supporting Power over Ethernet, the IP Phone 2004 eliminates the need for power splitters and AC outlets, resulting in a more reliable and cost effective solution. 10Mps/100Mps full-duplex "Locked Up" connections: The IP Phone 2004 can now be manually configured to either 10Mbs or 100Mbs. This ability to "lock-up" the connection ensures full-duplex audio in environments where the Data Switching Equipment does not auto-negotiate the connection. Direct connection to LAN allows customers to capitalize on the economies of a simplified wiring system within the enterprise. Enterprises can flexibly provide users with features and services they require to balance user functionality, streamlined management, and reduced facilities costs. The IP 2004 Phase 1 Internet Telephone is supported by multiple Nortel Networks communication systems, including Business Communications Manager (BCM), IP-enabled Meridian 1* and Meridian SL-100 systems (with Internet Telephony Gateway cards installed), and Succession Communication Servers.